In 1943, Sylvia Mendez, her two brothers, and three cousins all go to the local 17th Street Elementary School to register. Sylvia’s light-skinned cousins are accepted, and she and her brothers are told they’ll need to enroll at the inferior Mexican school, father from their home. Sylvia’s parents aren’t having it, and push back, filing file suit, undertaking multiple appeals, and ultimately prevailing. Tonatiuh’s account details the family’s many struggles, from the complexities of the legal process to the personal attacks Sylvia experiences. After rigorous research, and interviews with Sylvia herself, Tonatiuh delivers a story that is both compelling and inspiring. And his archetypal artwork, with its Pre-Columbian influences, connects the contemporary fight with its formidable ancestry. The strong lines, simplified postures, and fixed profiles convey the family’s resolute determination; theirs is a victory that comes from strength, and a strength that comes from family. This funny, gritty, tender story follows three young men growing up in Bed-Stuy, navigating the pressures and tensions that would pull them up or drag them under as they make their way to manhood. There’s Ali, bright, respectful and curious; Noodles, tight, irascible, and full of bravado; and his brother Needles, sweet, fragile, and genius. Needles struggles with Tourette’s, a syndrome his neighborhood doesn’t really understand, and finds solace in knitting (Ali’s mother’s very good idea), something else not everybody gets. Ali and Noodles have his back, until one night, at a house party, all hell breaks loose, and everything breaks apart. There is so much to love here. The crisp writing crackles with wit and rings with authenticity. The exploration of maleness, and the ways in which young men are called to define themselves, is bare and nuanced. Every single character lives and breathes in three dimensions. But for our playing card purposes, it is these boys’ inextricable relationship that beats at this marvelous novel’s heart. Theirs is a special bond, and no matter what comes at them, they belong to one another. For those looking for an especially immersive and gratifying experience, I recommend Random House Audio’s extraordinary audiobook recording, narrated by J.B. Adkins. This bright, instructive exploration of different mammal families offers lots of concrete information about what mammal babies need and how mammal parents meet those needs. Sections feature a brief identification of a particular need on a single spread, followed by a few pages with specific examples of different species attention to it. The text is full of fascinating explicatory zoological detail about everything from food to shelter. But the star of this charming outing is Judge’s open, inviting portraiture that finds a perfect balance of natural authenticity and friendly accessibility. The informative text provides the facts and figures, delineating our common place in the natural world, and the warm, soulful imagery makes good on that promise, allowing the reader to feel the connection as well as understand it. In a world where growing up can feel like a daunting endeavor, how comforting it is to know that we’re all in it together. The grief surrounding her mother’s death and the havoc it wreaks on her family pushes Angel to breaking. She slips onto the streets, and soon is in thrall to charming, malevolent Call and his “candy.” At first she’s doing favors for his friends, but in short order she finds herself working a corner to support herself and her habit. She is broken and resigned, until Call shows up one evening with eleven-year-old Melli in tow. Angel searches her soul to find an untapped store of resilience and resolve, and sets out to rescue Melli, and maybe, herself. Leavitt writes in stunning, atmospheric free verse, and somehow manages to craft crystalline beauty from brutal, harrowing circumstances. Angel’s first-person narrative swings between blunt resignation and fierce defiance, beautifully articulating the confused despair of her gradual destitution and the clambering strength of her willful climb back up. It’s a staggering piece of writing–searing and evocative–and leaves the young reader with a profound understanding of the complex circumstances some teens face, full of empathy and free from judgment. Negative space is an artistic construct that looks at the visual space around or between subjects as a place in an image where meaning can exist and communicate itself: objects can be defined by their own outlines, or by the outlines of adjacent objects. The construct has application in the study of literature, too, as we consider how an idea is shaped not only by its own definition but also by the definitions of related concepts. 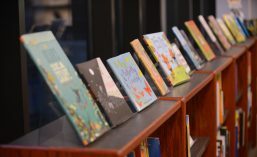 As we seek to understand “belonging” in books for young people, then, let us look not only at books that celebrate someone’s place in a particular community, but books that consider the refusal of such membership, too. Ann Bausum applies such an approach to American history in Denied Detained Deported: Stories from the Dark Side of American Immigration, seeking to understand how people came to this country, by looking deeply and carefully at a number of situations where that arrival was thwarted. She begins with the familiar Emma Lazurus poem that appears on the plaque at the base of the Statue of Liberty, followed by a contemporary poem by Naomi Shihab Nye that offers a decidedly less welcoming vision of the US border. From there Bausum investigates a number of historical events, each titled with a different form of alienation. “Excluded” looks at the Chinese Exclusion Act of 1882 which left Chinese immigrants ineligible for citizenship until 1943. “Denied” tells the story of the St. Louis, a ship carrying hundreds of German Jewish refugees that the US turned away in 1939. The author captures the events with arresting clarity, engaging the reader’s empathy and outrage with her precise language and documentary research. And on top of the harrowing stories Bausum posits questions about our contemporary treatment of those newest to our country, often subjected to xenophobic mistreatment and persecution. By exacting the nature of fearsome, systematized alienation, Denied Detained Deported delivers a powerful picture of how important it is to belong. Colby and Bev have been saving for years (and years) for their year-long-backpack-around-Europe-before-college-trip. It’s going to be the best. They’re best friends, after all, and, well, Colby is pretty much in love with Bev. Except Bev isn’t going. She’s going to college instead. She applied ages ago. Sorry. To make matters worse (or not quite so bad), Colby will be spending the summer before he’s not going to college traveling around with Bev and Meg and Alexa, The Disenchantments, managing their Pacific Northwest tour from his Uncle Pete’s VW van. There is some road-trip revelry here, and a goodly amount of deep adolescent angst, that keep things moving and give us plenty to think about along the way. But the novel’s real genius comes from profound clarity and resonance with which LaCour paints Colby’s circumstances. To be sure, not many of us have experienced this particular turn of events, but she makes something universal of the skittish confusion and achy disorientation that come when the dependability of high school gives way to the unknown of what comes next. It’s no easy path to tread, and Colby’s way through is thrilling and sad and powerfully affecting. By getting the trauma just right, LaCour makes the resultant growth immediately recognizable and especially gratifying.